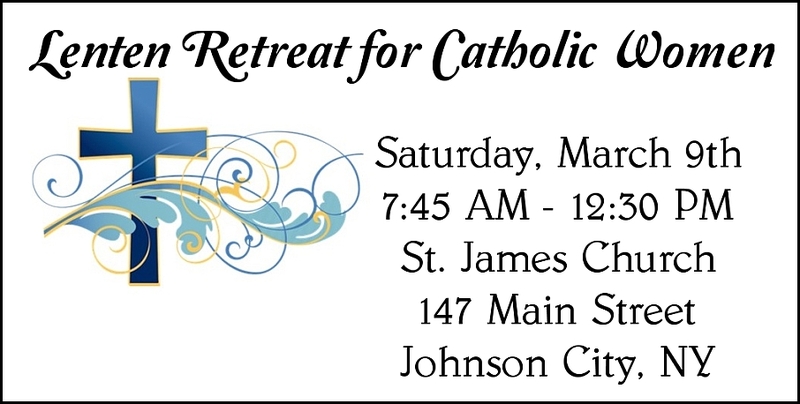 A Lenten Retreat for Catholic Women – Saturday, March 9th, 7:45am-12:30pm, at St. James Church, 147 Main St., Johnson City. Registration begins at 7:45 am. The retreat includes Holy Mass, breakfast, speaker reflection with Rev. James Tormey, confession and Eucharistic Adoration. Registration is $20. Register by: mailing the Women’s Commission, c/o Diocese of Syracuse, 240 E. Onondaga St., Syracuse, NY 13202 or by emailing swc@syracusediocese.org. or register at the door.